More than 16,000 BBC Sound Effects are made available by the BBC in WAV format to download for use under the terms of the RemArc Licence. The Sound Effects are BBC copyright, but they may be used for personal, educational or research purposes, as detailed in the license. You can also use the search functionality on the page to find a specific sound in these 16,000 BBC Sound Effects. To see the archive click here. You can find many sounds in the archive. For example, I searched for “elephant” and there were 6 different elephant voices. 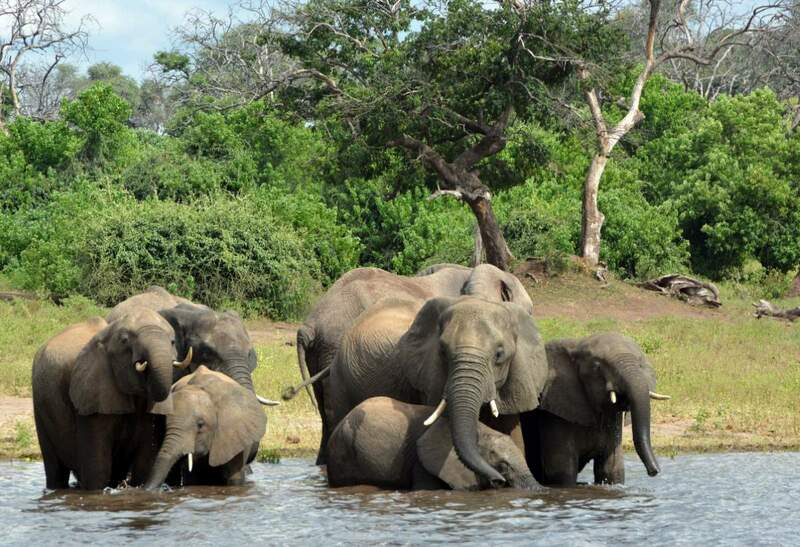 Image: Elephants in the Okavango Delta. The area is one of the best places to see animals and birds in Africa. The area supports large concentrations of animals on both a permanent and seasonal basis. A myriad of species are found within the delta including African Bush Elephant, African Buffalo, Hippopotamus, Lechwe, Topi, Blue Wildebeest, Giraffe, Nile crocodile, Lion, Cheetah, Leopard, Brown Hyena, Spotted Hyena, Greater Kudu, Sable Antelope, Black Rhinoceros, White Rhinoceros, Plains Zebra, Warthog and Chacma Baboon. Notably, the endangered African Wild Dog still survives within the Okavango Delta and exhibits one of the richest pack densities in Africa. In addition to these large animals, the Okavango Delta also supports over 400 species of birds and 71 recorded species of fish including Tigerfish, Tilapia, and Catfish. Thanks to this wide variety of wildlife, the delta is now a popular tourist attraction. If you like cats, like me, try searching “kitten” voices! They are adorable.